Below are testimonials from some of my clients. Please don’t interpret these as statements on what I can do for your business. I can only pass on what I’ve done for others so far. 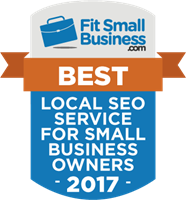 Voted “Best Local SEO Service for Small Business Owners, 2017” by Fit Small Business. —Michael Mandis, Owner, Alliance Mortgage Funding, Inc.
“I hired Phil in early 2015 for his X-Ray service. We’re entering 2019 and I’m still ranked on the first page of Google for very competitive keywords that keeps my phone ringing on a daily basis. “Without a doubt, if it wasn’t for his guidance, my business would not be where it is today. A big regret I have is waiting too long to hire him. I was a long-time reader of his blog and wanted to figure it all out on my own without paying for help. Had I just hired him from the very beginning, my business (and life) would be much different right now. “There’s no guesswork with his X-Ray. He gives you a full-report of things you need to work. on. You simply take action on his suggestions. “He’s very responsive and helpful when you ask questions. I’ve hired him for the X-Ray service and for a one-on-one call and each time I was blown away from the value he provided. 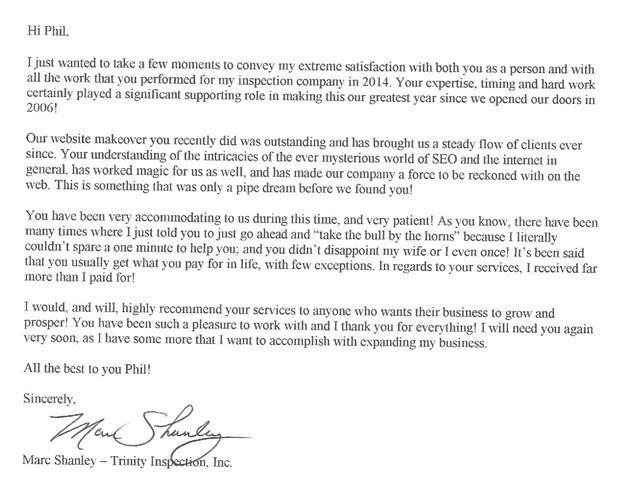 “Phil has definitely been one of the top people that have helped me in my business. I highly urge you stop waiting to hire him. Take action on what he says and you will see dramatic results in your business. —Jeffrey Nadrich, founding partner, Nadrich & Cohen, LLP. —Lenny Kammes, Kammes Colorworks, Inc.
“My business as a firearms instructor is very local. Most of my revenue comes from teaching a handgun law course that is required for the Texas License to Carry. While there is a lot of interest in this, there are also a lot of instructors, probably 20-30 within 20 miles of me, including every shooting range. The conventional wisdom has been that clients won’t travel more than 10-12 miles for such instruction. Customer loyalty is a very minor factor, as most of these people I see only once. “Because I come from a computer science background, I was able to build my own website, but I knew there were features of both technical SEO and social media marketing that were beyond me, as well as traps laid by Google that could sink my rankings. I was looking for some help in optimizing my exposure without a long-term contract, when I found Phil. “I was hesitant at first to spend several hundred dollars, but after reading his free newsletter, and the articles on his website, I decided that if he could give away such valuable tips, the ones he sold must be even better. I was right. “His list of suggestions had remarkable results. There might not have been any single item that was a game changer, but the sum of the suggestions, and the directions they took me, allowed me to position my business so that, when current events led to a surge in interest in my offerings, I was in the right place. My website traffic now is double and triple what it was, and people are registering for my classes over a month in advance. Some people drive 40 miles to get to me. 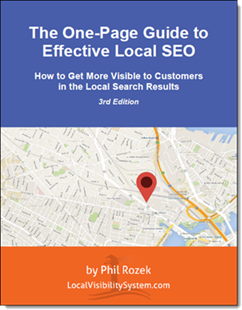 “After getting sick of paying through the nose for ads, I hired Phil back in 2010 to help get my landscaping business more visible in local search. He helped me do so and within a few months my local Google rankings got to the point where I was able to turn off my ads and save about $1,100 / month in ad spend. “I then got Phil’s Done for You service the following winter (for my wintertime business, rooftop ice removal). He kept me in the Google Places Top 3 all winter (and I’m still there to this day), and this was a major factor in having the most profitable winter in my 16 years in business. I’ve since hired Phil for help in just about every other online aspect of my business. —Joe Palumbo, President, Palumbo Services, Inc.
Phil is great at what he does! His audit of our site was super helpful and increased our traffic once implemented. “Let’s face it, running a business is not an easy task. Most days spent dealing with customers, paperwork, and figuring out how you’re going to fit a decent meal in between. I’ve had to learn through the years to take a step back and really think about what I can and can’t do for my company. Websites, reviews and Google Places is not my strong suit. —Jeff Unthank, Closet Tec Inc.
“One day I received a call off my webpage from a potential client. Before the client discussed his case, he wanted to tell me that he is an IT professional….He wanted me to know that I was the first professional he has spoken to where he can’t tell me that he can help me with my website or search engine optimization. He stated that whomever I am using, it is money extremely well spent. He said that as soon as he did a Google search in his area for a lawyer, I immediately came up on his screen. The following day he hired me. “I had signed up for Phil’s newsletters and started getting VERY valuable, succinct, SEO information. There is so much out there to read and stay up on but he would focus his newsletter on just achieving one thing. The more I read, the more I liked what he had to say. If I shot him a question back, he was always quick with a reply and if he didn’t know the answer he told me where I could find it. —Dan DiTomaso, President, Stone Masters Inc.
“Since I bought one of Phil’s local search reports for Google Places my site is producing off the charts. I used to think that just having a web site was enough and I would get a couple of calls here and there but now with a couple of fast, free and easy techniques and tweaks that Phil showed me I am getting 50 to 100 calls a day. My phone literally rings off the hook! The economy is horrible but I am wringing out every drop and doing better than I did when it was booming thanks to where I show up in the search engines. I highly recommend Phil’s help to everyone that has a business and wants to dramatically reduce advertising costs and increase the volume of calls to your office. It was money well spent! Thanks Phil! —If you’re interested in discovering more about how I might be able to help your business get more visible to local customers, feel free to contact me or to check out my services.